Have you ever seen that cutesy movie called Ratatouille? I had several tries before I was finally able to stomach watching a rat cooking food. I find whole concept revolting. About a month ago, I caught this rat in our ceiling. It's a real rat. It gnawed a hole in my partition wall! Now can you imagine this rat moving around in your chef's hat? Cooking food in a fancy restaurant? That just makes the hairs on the back of my neck stand. Lol! The World's largest rodent, a domesticated capybara they named Caplin Rous, owned by Melanie Typaldos, who adopted the pet from a breeder two and a half years ago. Now that is just ...I can't even look at it, hahaha! lol! it looks a bit like a warthog with a bigger nose and minus the tusks. Di ba ang warthog ay baboy - so "baboy-daga" sya. wah! Disgusting? I think Caplin Rous is the CUTEST Capybara I have ever see... and I think Capys are DARLING! It's not Photoshopped! It's the real thing - and it's as big as a dog! Oh, capybaras are so cute! (You should look up some of the videos on YouTube. They look like giant guinea pigs - which I believe are also in the rodent family.) I'm not big on mice and rats running wild in my house, but some rodents are fun. Oh, it's for real. :) I'd like a capybara. They're cute! Laurie B, I agree with you in principle, but the tone of that comment was haughty and unsympathetic to those who have serious issues with rodents. (And while I recognize that spiders, too, are God's creatures - I've been known to do the spastic dance and yell "Kill it, kill it, kill it!" over a small jumping spider. I think we all deserve a little compassion and kindness with our "re-education.") 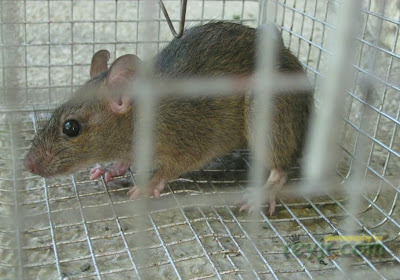 For whatever reason, many people do have a fear and loathing of rodents; perhaps dating back to when rats spread plague. Unfortunately, there was nothing in your comment that was designed to persuade them to feel differently OR to foster "peace." I'm adventurous when it comes to food, Rey, but chicken poop is NOT FOOD. Anyone who eats unwashed intestines is just asking for gastrointestinal distress and possible death! There's "adventurous," and then there's "just plain STUPID." "Isaw is a street food from the Philippines, made from barbecued pig or chicken intestines. The intestines are cleaned, turned inside out, and cleaned again, repeating the process several times. They are then either boiled, then grilled, or immediately grilled on sticks. While popular throughout the Philippines, Isaw has taken on an iconic status as a campus staple at the University of the Philippines Diliman. The UP Isawan (Isaw stall) is a used as a regular setting comic book artist Manix Abrera, in his daily KikoMachine comic strip on the Philippine Daily Inquirer." See? They're cleaned. Not once, but SEVERAL times - turned inside out to do it, no less. It's okay, really. Do you eat sausage of any kind? What do you think is the stuff that holds the ground meat together?? Wow, this is quite a conversation! I enjoyed the movie but I have to say I didn't spend a lot of time thinking about real rats when I was watching it. it doesnt look like a rat anymore. hehe mejo cute nga eh. Lol. I just couldn't not think about it because, well, it was the main character. Hehe. :) Thanks for the visit and the comment Brenda. But the chicken intestines, I think, are too small to clean properly. Hehe! Everyone I know who eats isaw actually agrees - but they still eat and enjoy it because it is yummy. Lol! Incidentally, the paragraph you quoted about the University of the Philippines Diliman? Yep, I went to that University. Hehe.